An ultramodern masterpiece, La Rive Penthouse http://larivepenthouse.co.za/ has opened for exclusive-use bookings on Cape Town’s platinum mile in Mouille Point. An exceptional private home where luxury and space defy all expectations, the deluxe penthouse with rooftop swimming pool accommodates up to eight guests and is designed for glamorous, seaside and city living at its best. Immaculately presented with the highest calibre of top-of-the-range finishes, the plush and sophisticated living areas feature unique art deco pieces, custom designed furniture and a private art and book collection to complete the rich and multi-layered interior design. A private elevator offers direct access from the dedicated multi-car parking garage to a dramatic, grand double volume entrance with twin stairways. Architecturally designed with generously proportioned windows to make the best of the uninterrupted views, inter-leading living and dining spaces flow seamlessly to the private terrace and a delightful entertainment area that expands to the terrace and private pool. Four light and spacious bedrooms have en-suite bathrooms and private balconies, including a magnificent master suite, complete with a dressing area and walk-in closet, that provides direct access to the pool deck. Other special features include two elegantly furnished private studies, one of which can be converted into a 5th bedroom suite if required, a private gym, and a slick, compact designer kitchen with state-of-the-art appliances. Bedrooms feature individually controlled air conditioning and flat-screen TVs, with full DVD system in the main bedroom as well as the TV room, and all en-suite bathrooms are equipped with double basins, baths, separate showers and heated towel rails. 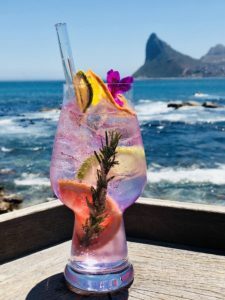 Backing the global ‘straw war’, Tintswalo Atlantic has banned all plastic straws on site at the hotel on Chapman’s Peak in Cape Town, and replaced it with the use of re-usable glass straws. Lisa Goosen, the owner of Tintswalo Atlantic says: ‘According to National Geographic, although straws amount to a tiny fraction of ocean plastic, their size makes them one of the most insidious polluters because they entangle marine animals and are consumed by fish. Our location right on the Atlantic Ocean, where we witness amazing sea life every day, constantly reminds us about the vulnerability of nature and we feel very strongly about supporting the environmental campaign to stop using plastic straws to help save the oceans. Apart from the use of glass straws in the hotel, it is also a popular gift item offered for sale in the hotel gift shop’. The quintessential luxury Cape winelands villa, La Rive Franschhoek http://larive.co.za/ has opened for exclusive-use bookings. 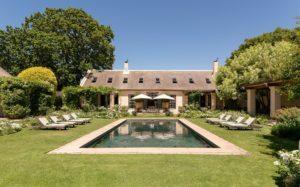 Tucked away in sprawling private gardens on 2,5 acres of land, the traditional, privately owned Cape manor house offers privacy and security, yet is located in the heart of Franschhoek and within walking distance of its restaurants and other attractions. Designed with deep verandas and a covered terrace with several lounge and dining areas set around a magnificent swimming pool, La Rive provides a warm and welcome home to families or groups of friends travelling together. Its bespoke, elegant interiors are a marriage of colonial English and traditional Cape Dutch heritage within a contemporary colour palette showcasing collection pieces by artists from across the globe and an alchemy of classic and artistic influences throughout the villa. Mhondoro Safari Lodge & Villa has introduced a guided excursion to the two rock art sites located within Welgevonden Game Reserve in the Waterberg (Limpopo province, South Africa). Both sites contain layers of San Bushman ‘fine-line’ paintings, as well as later finger-painted images. The images date back hundreds of years, with the oldest paintings likely to be thousands of years old. It is suggested that the San moved around the Waterberg around 2500 years ago, followed later by the arrival of Bantu speaking tribes from West Africa, arriving to trade with their cattle and sheep, as well as grains. The rock art excursion is included in the accommodation rate at Mhondoro, or may be booked by day visitors by prior arrangement (subject to availability), at a cost of R1350 per person, including a bush picnic with cold drinks and house wine. South African rock art is a precious historical and cultural asset. Visits to the two sites in Welgevonden can be incorporated within the morning and afternoon safari game drives to further enhance and enrich the Mhondoro guest experience. 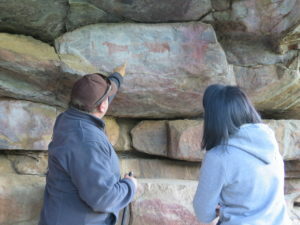 Participants in the interpretive rock art excursion are accompanied by a qualified armed guide from Mhondoro, and will be required to walk about 500m to the rock art sites. Guests will view both rock art sites and learn more about the artists, the state of trance, why the paintings are painted in the different ways, and much more. The rock art on the overhang of the site referred to as Onverwacht, is located on the banks of the Taaibosspruit. It consists of many different paintings, covering an area of about 30 metres, and includes both finely painted images typically associated with the San, as well as finger paintings and handprints. The latter is considered to be the work of either incoming herder people, or Bushmen whose painting style was influenced as a result of the arrival of herder people in the area. The antelope figures found in this particular rock art site are typical of San fine-line paintings and their spiritual belief. Bushman paintings are thought to be a medium through which the medicine man, or Shaman, shows the community what he experienced when he went into a trance state, visiting the spiritual world after hours of dancing around a fire to reach this point. Some paintings combine the characteristics of human and antelope, where the Shaman draws upon the power of the antelope to become stronger so that it is believed that he can provide special services to the community, including healing the sick, controlling the movements of game to hunt, and making rain. Other paintings in this site include at least eight sets of arrows, a human figure, and certain geometric designs. Several handprints in yellow can also be seen. Primarily the Bushman used ochre to paint with, but they also used iron oxides, white clay and crushed ostrich shells, while in the last hundred years, coal was used too. Various binders, such as egg white, plant sap and blood were mixed into the paint to ensure that the paint would stick to the rock surface. The second rock art site within the Welgevonden Game Reserve is called Vanderwaltsdrift, situated on the western bank of the Sterkstroom. Here the paintings occur in two areas, the largest area includes the remains of several finger-painted human figures. Other images that can be seen here are animal spoor, the hoofprint of an antelope species, as well as an elephant footprint, paying homage to the Welgevonden of today, where wildlife is abundant again and many species of game are protected, including the Big 5. 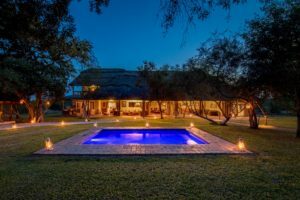 The Manor House at Tintswalo Safari Lodge has reopened after an extensive refurbishment of the exclusive-use villa, which is situated within the Manyeleti Game Reserve (bordering the Kruger National Park, the Timbavati and Sabi Sand game reserves).